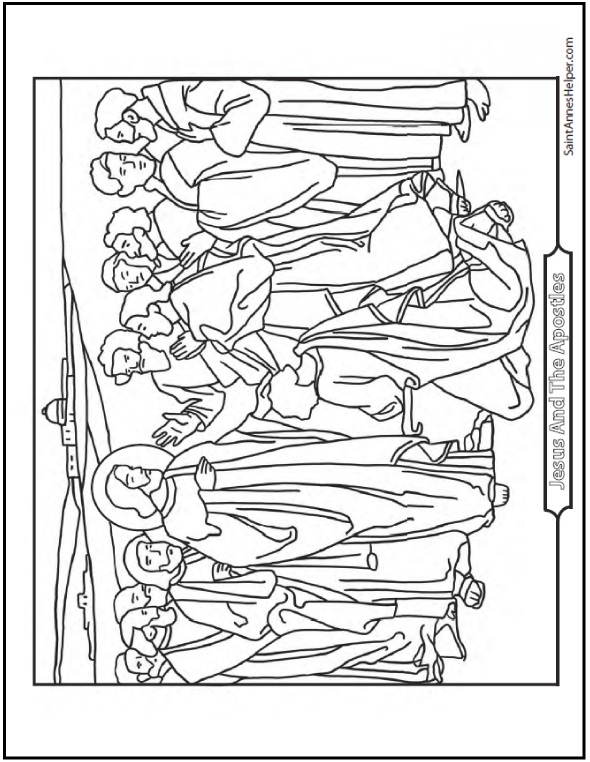 Use a coloring page of the 12 Apostles Of Jesus Christ to teach the Apostles' names in catechism or Bible class. This is the moment when Peter said that he believed that Jesus is God and when Jesus gave him the Keys to the Kingdom, changing his name from Simon to Peter and making him Prince of the Apostles. This PDF prints 8.5x11" single sided. Here's a picture of the twelve Apostles of Jesus Christ at the time Peter makes his profession of faith that Jesus is God. The names of the 12 Apostles of Jesus Christ are: Peter, Andrew, James, John, Philip, Bartholomew, Matthew, Thomas, James, Simon, Jude, and Judas. Learn more about the Apostles Creed here.